I see all around me a fervour. A zing in everybody's step. 26th Jan 15 is Republic Day for India, and all Indians are proud. Today is the day when the constitution of India came into force 65 years ago. I see parties, celebrations, events, flag-hoisting ceremonies and patriotic songs (interspersed with the occasional Bollywood item number). I see Facebook posts, photos of the tri-colour, selfies against national backdrops, images with the tri-coloured theme as a meme on WhatsApp, nationalist sentiments everywhere. I see group admins change their group display pictures on WhatsApp, I see cover pages updated to reflect the tricolour on Facebook, I see profile pics on Google undergo a transformation into suddenly renewed "Indian-ness". I see a deluge of nationalist pride everywhere online. All good so far. But personally, I also sense the need for introspection. 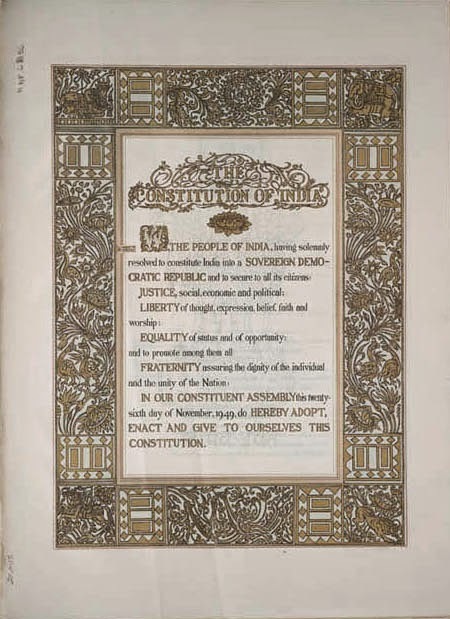 The constitution of India was a document that was drafted in a 2-year period from 1947 to 1949. At the outset, let me state (for the benefit of those fringe groups who take affront at leaves falling from trees) that the Constitution of India is an exhaustive and well-drafted document. It covers a vast gamut of legislation that was critical and needed. It is carefully researched and in no way do I intend to contradict that. The point of this post is different. The Constitution is a huge document that calls upon various legislations in the past (primarily the Government of India Act 1858, Indian Councils Act 1861, Indian Councils Act 1892 and the various amendments and modifications done thereto between the late 1800s and the early 1900s). Essentially, in 2015 we are celebrating a constitution created in 1949 (around 65 years ago) based on laws originally promulgated in the late 1800s (around 150 years ago). I'd say it's time to revisit this document and prune it wherever required. Articles 15 and 16 of the constitution which talk of allowing governmental bodies to make reservations based on caste. Article 44 which talks of the duty of the state to implement a uniform civil code. This is still a pipe-dream and needs to be picked up urgently for any social reform to happen. Let's go into each in a little bit more detail. 3.16.4 - Nothing in this article shall prevent the State from making any provision for the reservation of appointments or posts in favour of any backward class of citizens which, in the opinion of the State, is not adequately represented in the services under the State. 3.15.4 - Nothing in this article or in clause (2) of article 29 shall prevent the State from making any special provision for the advancement of any socially and educationally backward classes of citizens or for the Scheduled Castes and the Scheduled Tribes. All points in both these articles talk about various public facilities, employment opportunities, other public amenities and the sanction given to the government to make reservations or special provisions for "backward classes" of citizens in order to protect the fundamental principle of equal opportunity therein. All good so far. But the fact of the matter is, reservation is an obsolete concept and caste-based reservation even more so. It has been misused and taken advantage of. The results of course, are there for all to see. Sub-standard teachers have churned out sub-standard students, sub-standard professionals have churned out sub-standard services and the rot is setting in deeper with each new added quota. I'm all for equal opportunity, but not at the cost of meritocracy. What is needed is to change the definition of "backward classes". Currently defined on the basis of caste, it needs to discard this framework and take into account financial standing. The poor can become the backward class irrespective of what caste they belong to. They shall enjoy privileges in order to ensure equal opportunity. We need to take a second look at both these articles (and related articles, clauses and sub-clauses interspersed throughout the constitution) to discard the reservation/quota system and replace it with a framework that gives these rights to the poor and the financially challenged. 4.44 - The State shall endeavour to secure for the citizens a uniform civil code throughout the territory of India. This has never materialized. Such an explicit statement as article 44 has been ignored and relegated to the back-burner just to serve the vested interests of certain communities and people. The Shah Bano case showed us how critical it is to have all communities follow the constitution. Till some communities operate outside the constitution with impunity, we shall never have equality in any form or manner. The Constitution of India has to supersede any religious laws without exception. I have expounded on this topic exhaustively in a previous post. You can check out the full text here. Having said that, I am sure that if a panel were to be constituted along modern principles of jurisprudence to analyze the entire Constitution of India, it would throw up some interesting findings other than the two sections I have highlighted above. I feel we should take the occasion of Republic Day to think about the Constitution of India in a new light. As the world's largest democracy and a global power at the centre of the world stage, it is our duty to lead the way to reinvention of our own principles as a means to adapt to our constantly changing environment. Celebrating Republic Day is all very well. But it is also our duty as citizens of this country to introspect on our own tenets, analyze our own codes and improve them in order to ensure that the fundamental principles of democracy in particular and humanism in general are upheld.